The space shuttle Discovery lifts off on its STS-131 mission April 5, 2010. CAPE CANAVERAL, Fla. ? Four intrepid women with the rightstuff have sailed into the world record books as the most female astronautsever to fly in space at the same time. 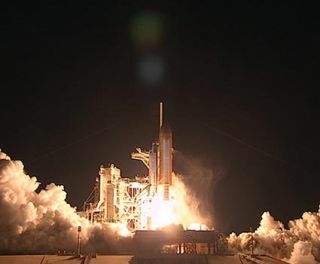 Discovery launched into space at 6:21 a.m. EDT (1021 GMT)in a pre-dawnlaunch from NASA?s Kennedy Space Center here carrying sevenastronauts and vital supplies toward the International Space Station. Three of seven astronauts on Discovery are women. Theyinclude former high school teacher Dorothy ?Dottie? Metcalf-Lindenburger, roboticarm expert Stephanie Wilson and Naoko Yamazaki, the second Japanese woman everto reach space. Rounding out the female space quartet ischemist-turned-astronaut Tracy Caldwell Dyson, who is living on theInternational Space Station after arriving at the orbiting laboratory onSunday. The four female spaceflyers will meet up on Wednesday to form thelargest gathering of womenin space in history. Discovery?s flight is only the third in NASA history tolaunch with three female crewmembers aboard. There are still more men thanwomen in space today, with nine men (four on Discovery, five on the spacestation) currently in orbit. The first woman in space was cosmonaut ValentinaTereshkova, who launched in June 1963 on the former Soviet Union?s Vostok 6mission. The first Americanwoman in space came two decades later, in June 1983, whenastronaut Sally Ride rode the shuttle into orbit on the space shuttleChallenger. In all, 54 women have flown in space out of the 517people who have reached orbit. NASA?s current chief astronaut is veteranspaceflyer Peggy Whitson, who served two tours on the space station ?commanding the station as its first female chief in 2007. ?It?s a wonderful opportunity to be part of any crew,?said Wilson, 43, before flight. ?I hope it says that women have come a long wayand have worked really hard to be able to do any of the jobs related tospaceflight.? Wilson is an aerospace engineer from Boston, Mass. Shebecame the second African-American woman to fly in space during her firstspaceflight in 2006. Discovery?s current flight is her third trip to space. ?I hope that part of our legacy is that we continue to inspireyoung women [to] pursue careers in science, engineeringor math,? Wilson said. Metcalf-Lindenburger, 34, is making her first careerspaceflight on Discovery, but the drive to reach space has been with her sincehigh school, when she attended Space Camp in Huntsville, Ala., while in ninthgrade. She was teaching high school earth science and astronomyin Vancouver, Wash., when she found out NASA was looking foreducator-astronauts in 2004. She was researching a question from a student onhow astronauts go to the bathroom in space at the time. On this flight, Metcalf-Lindenburger plans to film someeducational videos about the role of robotics in space. She practiced countingdown to launch with her 3-year-old daughter Cambria many times before actuallyreaching space.? On Discovery?s actual launch day, Metcalf-Lindenburger held upa hand-drawn sign for Cambria with a rocket ship and the numbers ?5-4-3-2-1,? arocket launch countdown.???????? ?My daughter doesn?t know that there?s a big deal or nota big deal. To her, flying is cool, running around is being cool, and justrunning around and growing up as a kid is cool,? Metcalf-Lindenburger said. ?And there?s not a lot of distinction, and that?s how I want it to be.? Yamazaki, 39, is Japan?s second female astronaut and saidshe drew much of her inspiration from her country?s first woman spaceflyerChiaki Mukai, who first flew in space in 1994. A fan of science fiction filmsand anime cartoons, Yamazaki chose aerospace engineering as her profession andjoined Japan?s astronaut corps in 1999. Her husband was extremely supportive of her space career,and even left his own behind so she could continue training to fly in space.This mission her first spaceflight. ?It was especially important to me that my husband quithis job and made it possible for my family to stay together as much as possiblewhen my full-scale training started in 2004 in the U.S.,? Yamazaki said. ?Thesedays, more women continue their careers after marriage, but how you juggle yourjob and housework may differ depending on each family's environment, and thereare various ways to do that. My family has learned to handle it through trialand error.? Caldwell Dyson has had a different road to space than herthree shuttle comrades. She launchedto the space station Friday on a Russian-built Soyuz spacecraftalongside two Russian cosmonauts. A former chemist and electrician, Caldwell Dyson is onher second spaceflight, though this one is a six-month trek as a flightengineer on the station?s Expedition 23 crew. It was NASA?s first Teacher-in-Space program, whichrecruited Connecticut teacher Christa MacAuliffe into NASA?s astronaut ranks inthe mid-1980s, that allowed Caldwell Dyson to consider a career in spaceflight.Until then, she thought NASA?s ?right stuff? requirement meant being a militarypilot ? and a man. But seeing MacAuliffe, who later died with six crewmatesduring the Challenger accident, changed her mind. ?You start to realize that I?ve got something in commonwith this person, and if a teacher has ?the right stuff? and a teacher?steaching me all day long ? then it became very interesting to me,? CaldwellDyson said in a NASA interview. Caldwell Dyson will meet up with the three spaceflyingwomen (and four men) aboard Discovery on Wednesday, when the shuttle is due todock at the International Space Station to begin more than a week of jointwork. The three female astronauts aboard Discovery will spendabout 13 days in space before the shuttle is due to return to Earth on April18. Three spacewalks are planned during the flight, which is one of NASA?s lastfew remaining shuttle missions before the space agency retires itsthree-orbiter fleet later this year.